A new handbag designer is quickly becoming one to watch. Knox, a new brand of 'utility leather' handbags is turning logos into a thing of the past. Crescent moon-shaped designs take the place of double letter details. 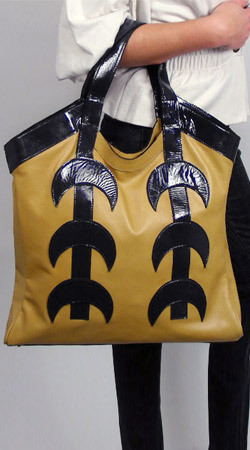 I adore geometric shapes incorporated into clothes and handbags; very reminiscent of the 60’s, with mod inspired details. The brand has three great bags that I instantly fell in love with. The 'Retrograde' Satchel ($482) is a sizeable half-circle shaped bag, with dangling straps and Knox's signature half-moon metal plate. 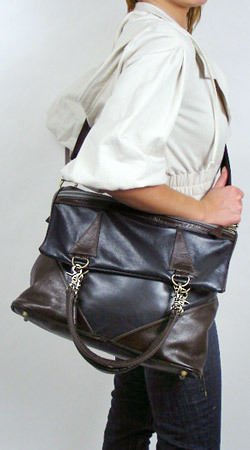 The Large Crescent Tote ($306) is a massive, trendy tote. Mustard leather gets a dose of Spring touches with black patent trim – cute crescent shapes lie atop the straps on the face of the bag. 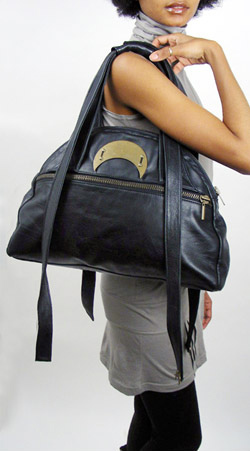 A third bag sans the crescent shapes is just as fashionable and functional – the Small Quintana Bag ($460). As the convertible handbag trend becomes more and more popular, this bag comes just in time. It has multiple compartments, zippers, straps, handles – everything a busy girl needs! Satisfy your Knox fix at Knox NY.com.